PARIS — A powerful explosion tore through a bakery in central Paris early on Saturday, killing at least three people, including two firefighters, and leaving smoke, flames and scattered debris in its wake, the authorities said. Police and city officials said the blast, which occurred on Rue de Trévise, was believed to have been caused by a gas leak. The Paris prosecutor’s office said that 47 people had been injured by the explosion, 10 of them critically. Emergency medical workers used helicopters to help evacuate some of the injured, picking them on the square in front of the Paris Opera house and taking them to hospitals. Spain’s Foreign Ministry said that a Spanish woman had also been killed in the blast, and that a Spanish couple were being treated in the hospital. 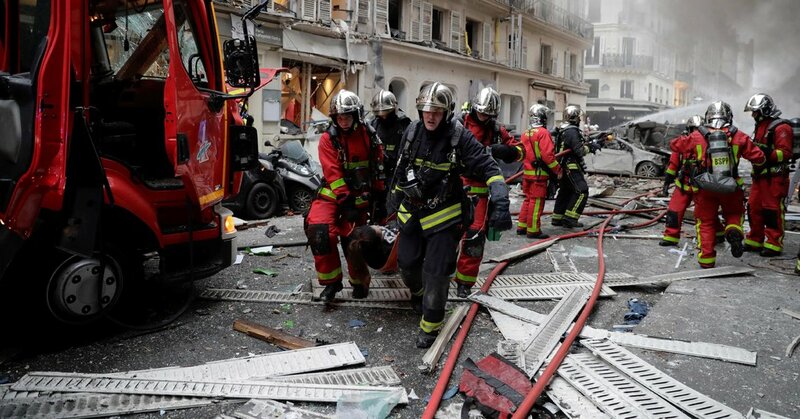 Christophe Castaner, the French interior minister, said two Paris firefighters were among the dead. Firefighters had been responding shortly after 8:30 a.m. to calls about a gas leak at No. 6 Rue de Trévise, at an intersection in the 9th arrondissement of the capital, and had asked residents to turn of their gas supply and stay inside. But minutes later, a huge blast shattered windows, burned cars and startled residents who were just starting their day. Matthieu Croissandeau, a French resident, was parking his scooter on a street nearby when he heard the explosion. The shock wave set off alarms throughout the neighborhood, he said, and he saw thick smoke billowing. An emotional Mr. Castaner praised the firefighters, telling reporters that they had been able to save seven people, including one firefighter who had been trapped underneath rubble for more than two hours. About 200 firefighters battled the blaze and rescued people with ladders after the explosion. But Mr. Heitz said investigators were just beginning to investigate what had caused the gas leak and that all evidence was being considered. The explosion came as Paris and other cities around France faced a ninth week of protests by the “Yellow Vests” movement, which were previously marked by episodes of violence and vandalism of high-end stores. But there was no indication that the explosion on Saturday had anything to do with the protests. The Yellow Vests are protesting the social and economic policies of President Emmanuel Macron, whom they consider to be out of touch with their everyday needs. But the demonstrations have also come to express a wider discontent with the political and media elites. On Saturday, the biggest demonstrations were held in Paris and in Bourges, a much smaller town in central France that some protest organizers had chosen because it was closer to the regions where many of the Yellow Vests live. By midafternoon, there were 32,000 protesters around France, including 8,000 in Paris, according to the Interior Ministry. Though the crowds were mostly peaceful, sporadic clashes erupted in several places as the police used tear gas and water cannons to disperse the protesters. The damage after the explosion in Paris stretched for several blocks, with windows blown out, debris strewn around the street and fires still burning. “The shock wave was particularly violent and spread across the four streets of the intersection, over about 100 meters,” or over 300 feet, said Éric Moulin, a Paris Fire Department spokesman. The explosion occurred on a residential street in an area of Paris that is also well known to tourists, with many hotels and attractions nearby, including the Grévin wax museum and the Folies Bergère music hall. For many witnesses, especially foreign tourists, terrorism was the first explanation that came to mind, said Mr. Croissandeau. Anne Hidalgo, the mayor of Paris, said that all those who had been affected by the explosion, who were in need of shelter or who were looking for information about the blast could seek help at the 9th Arrondissement Town Hall. Many apartment buildings in Paris use gas for heating and other purposes, but deadly explosions because of leaks are rare. In 2016, an explosion caused by a gas leak in the 6th Arrondissement tore off the roof of an apartment building and wounded 17 people.